Bonewalker is a common Endurance creature card. It is part of the Houses of Morrowind expansion. 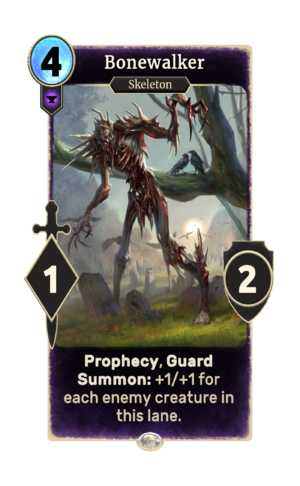 In addition to the card's availability in the Houses of Morrowind expansion, three copies are included in the Tribunal Glory theme deck, and two copies in the Telvanni Ambition theme deck. This card's summon ability applies the Walking Bones card effect.